58049 Littleton Colliery pulls out of the loop at Bristol East Depot and approaches North Somerset Junction on 10 April 1997 with the 4B05 17:47 Bath Oldfield Park to Westerleigh Avon Binliner, conveying both loaded containers from Bath and empties for Westerleigh. The loco had previously taken the third portion to Bristol Barrow Road, while the Bath containers were being loaded. 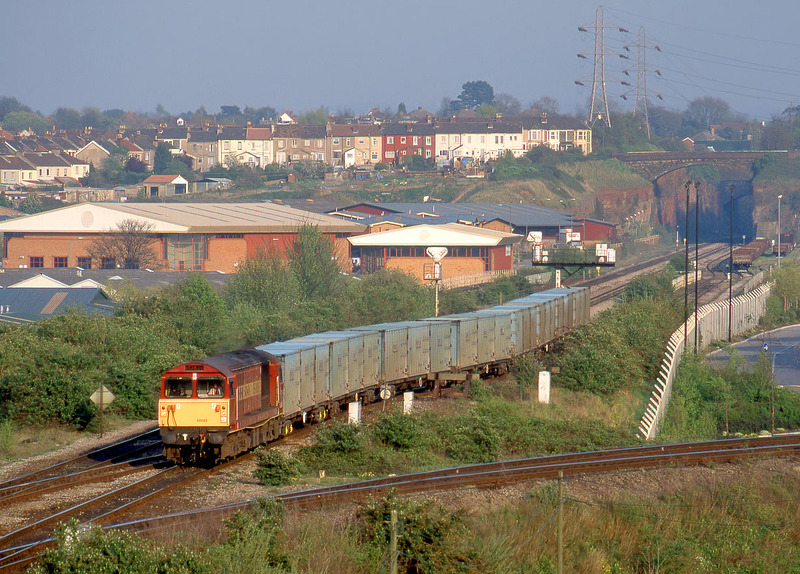 The line in the foreground is the North Somerset Junction to Bristol West Junction loop line that avoids Temple Meads station and gives access to St Philips Marsh depot.